Almost everyone has one in their attic, their closet, or in storage somewhere. The thrift stores always have at least 2 or 3. And not everyone has children who A) can fit into them to wear them again, or B) WANT to wear them. This means you have an outfit you spent a lot of money on that is just sitting around your house gathering dust. What am I referring to? The Wedding Dress, of course. You can of course modify a family gown to fit you. That is what I did with my Mom’s gown back in 1993 when I got married. My bust was bigger, I was shorter by 4 inches, and there was no way the lovely lace long sleeved top was going to fit me. So I took the train off and made a new top for the gown. The gown, the old lace top and all the scraps are in a box in my closet, waiting on the possibility of one of my daughters wanting to wear the dress. If they don’t? I can do what my Mother-in-Law did with her wedding dress: turn it into a Christening Gown. But what if none of that applies to you? What if the gown is just sitting there taking up space? At that point you need to start thinking of the gown as something other than a wedding dress. You need to start thinking of it as MATERIAL. If you are lucky enough to have a gown made of silk, you have yards of fabric just waiting to be dyed and turned into something fabulous. Even gowns made from poly materials can be dyed, although the results will vary as compared to gowns made from natural fibers. And if you are REALLY lucky, your dress (or a dress you find at the thrift store that fits) might be one of those retro styles that have come back into fashion, or that are suitable for costuming. In the late 70’s to early 90’s there was a resurgence in popularity of Victorian clothing. 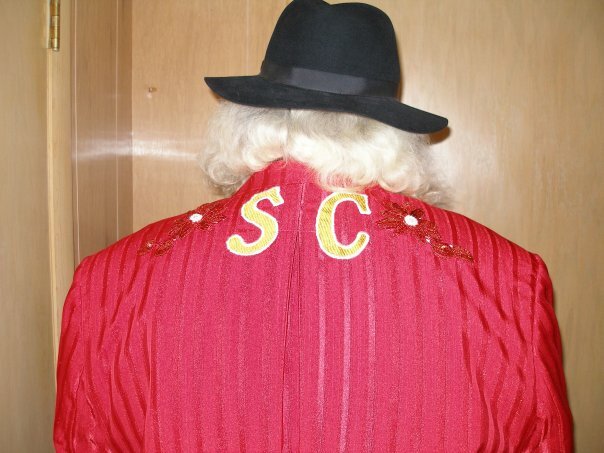 High collars, lots of lace, leg o’mutton sleeves – they were EVERYWHERE. You couldn’t walk into a shoe store without tripping over a pair of prairie boots. And if you are into Victorian or Steampunk costuming, this is to your benefit. Garments that are 30-40 years old are in much better condition that those over 100 years old. They are still sturdy, probably decently constructed, and readily available in thrift and consignment stores everywhere. But a year ago she decided she needed to do something else with the dress. She had 2 boys and didn’t think it likely that her future daughters-in-law would want to wear her early 90’s pseudo-Victorian style gown. However, the dress was made of silk dupioni, had beautiful sleeves and was ripe for transforming into something new. The dress was first stripped of the lace that had been tacked to the bodice, with the exception of the sleeves. The neckline was modified to a more traditional Victorian style, and then the garment was dyed by her sister Carol. 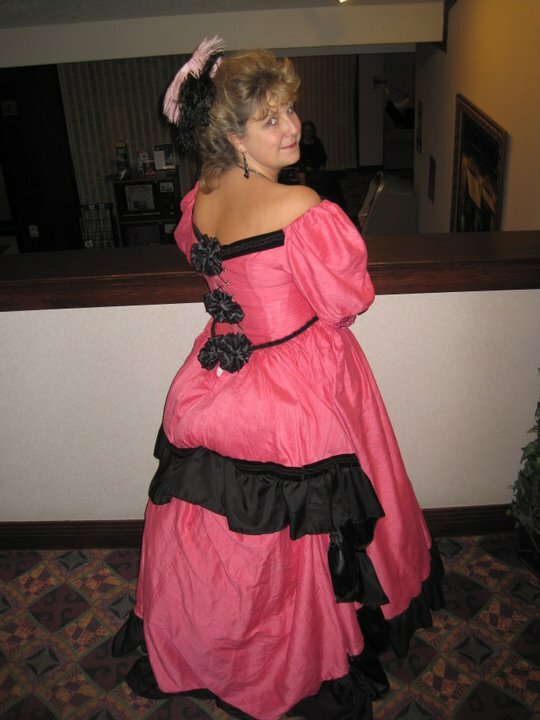 The plan was for the dress to come out a lovely red color, but in the end it came out bright pink. Which suited Lynn just fine. Lynn was close enough to her original dress size (lucky girl!) that there didn’t need to be a lot of adjustments made to the dress. However, grommets were put in the back instead of the zipper for ease of adjustment. Lynn wore the gown over her corset to make it fit better and look more period appropriate. Extra fabric was taken from underneath and used for a modesty panel in back and to make some fabric roses to cover the back of the dress. Black trim was added for an additional pop of color. 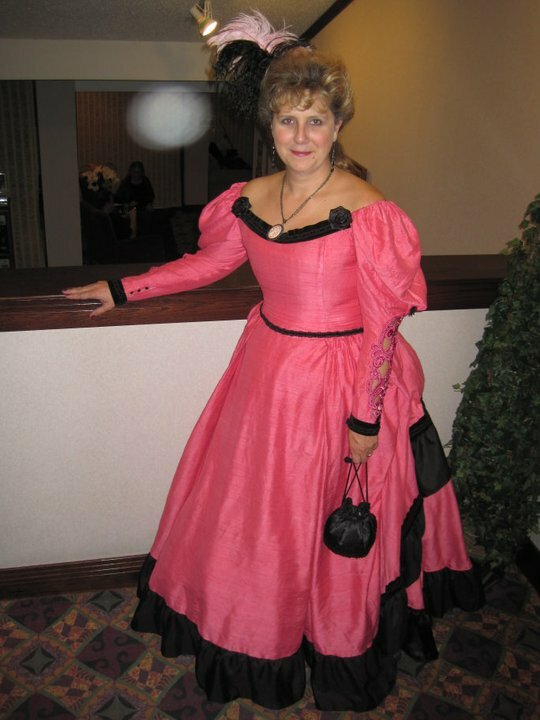 While the gown is not historically accurate, it passes at most events and works well for Steampunk. Another version that required significantly less work was the wedding dress that Erin found at Value Village for $1.00. She wore it for her Bridesmaid Bowling Birthday party and then decided to donate it again. 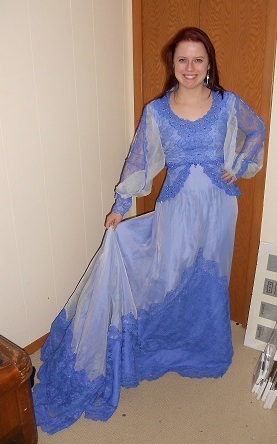 The blue had dyed the lace, the under fabric and the pearls. The machine tore a few holes in the garment, but they were not very visible, particularly in the back. Luckily the fit was very good on Ashley and the only alterations that were needed were to bustle the back, and at some time in the future to shorten the front a bit. Ashley may shorten the dress a lot in the front and turn it into a Steampunk style showgirl costume as a secondary option. But wedding dresses alone aren’t the only items in the formal wear section that can be reused. Bridesmaid dresses and prom dresses are suitable for altering as well. 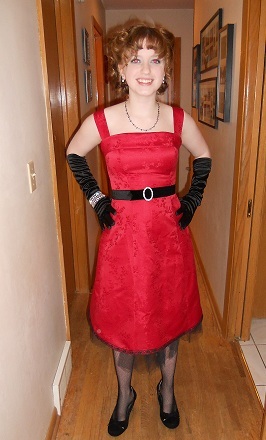 Erin found a red strapless 1980’s style prom dress for $5.00 at Savers. It happened to be the same size as my daughter and her best friend. They both liked the dress, and with a few changes it went from being a boring 80’s style dress to a retro 50’s cocktail style dress. The dress was cropped at the knee and black trim was added at the hem. The netting underneath was cut slightly longer to give a peek-a-boo affect. The extra fabric from the hem was used to make straps over the shoulders. A black velvet belt was added with a sparkly rhinestone pin. A retro hairstyle, gloves and kitten heels completed the look. Another dress that was repurposed was a pink Bridesmaid dress that Nell found at a thrift store in Madison, WI. She was making an 18th century style gown for a Rococco evening and found the pink dress and knew it would work well for what she needed. 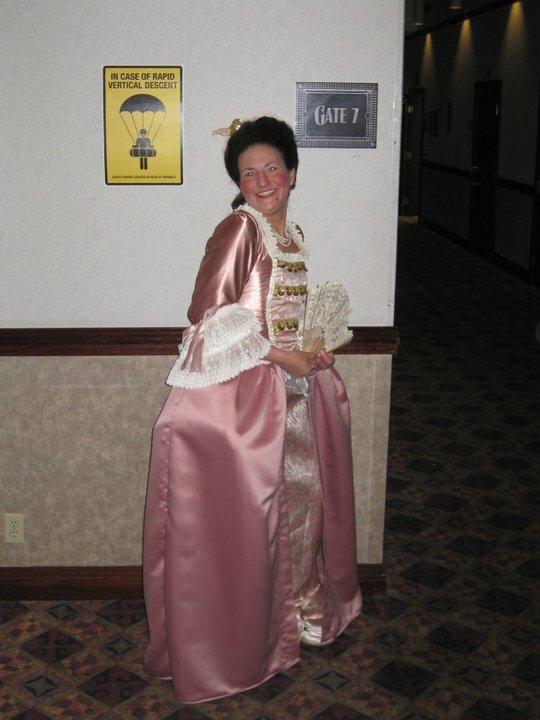 She purchased some lace and additional fabric and transformed the gown into her version of Marie Antoinette (her underneath support is not panniers or pocket hoops, but instead throw pillows attached to her waist via ribbons!). So before you throw out those cocktail gowns or old bridesmaid dresses or Grandpa’s suit, look at the fabric and the style and think of the possibilities. Your next costume might be waiting to be transformed, right there in your closet. So stop looking in your closet with frustration and start looking in there with inspiration! Please post any additional ideas, tricks or tips in the comment section! 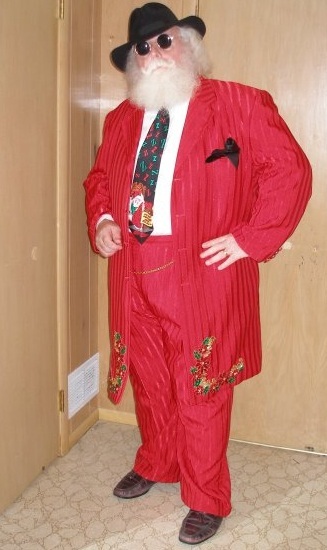 Wow, Santa looks *cool*! 😀 Nice job, everyone — those are some great repurposed outfits. What a great idea for modifying it for wearing!